I’m yet to meet anyone who doesn’t like cake and in a wedding world where people are leaving more and more traditions behind, the wedding cake is still going strong. In fact, wedding cakes are getting bigger, bolder and more extravagant than ever. Whether you ask family and friends to contribute to a ‘Bake Off’ table or commission a fabulously creative baker to create the cake of your dreams – serving people cake on the wedding day is a tradition that isn’t going anywhere. 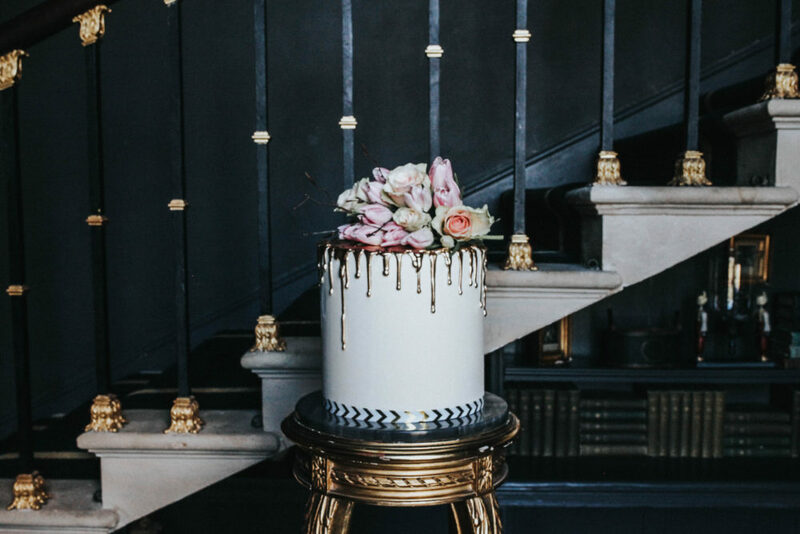 If you are having your cake made by a pro, we recommend having a look at our Love Lust List, a directory of wedding suppliers hand picked by team RMW, for their creativity, artistic flair and affinity for a cake covered in flowers. Oh and they bake things that taste good too. You may remember that a couple of weeks ago Adam, Charlotte and I wrote this post about our favourite sweet treats. It appears that you lot are quite partial to matters of the confectionery persuasion given the amount of discussion that followed the post…seventy-eight comments and counting folks! It also gave us here at RMW towers an enlightening glimpse into what makes YOU tick. For me personally though, it was Charlotte’s comment about the popularity of sweetie buffets and the perception held by some that they are ‘overdone’ or ‘so last year’ which really made me think. As you already know, we fully endorse the ‘your day, your way’ mantra. It’s important that you really love your wedding given the amount that you have invested in it both emotionally AND financially. So if you adore the idea of a dessert table, and hell who doesn’t given that they’ve taken the wedding world by storm, then ruddy well have one on your big day. 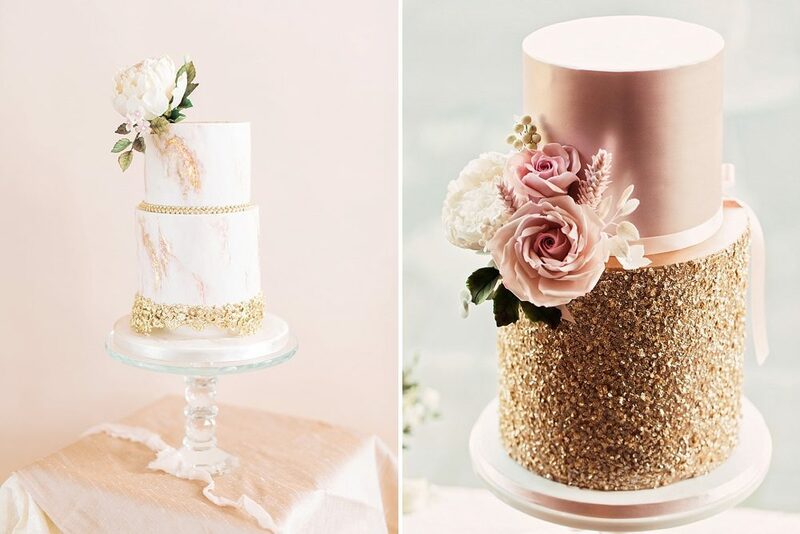 This post not only intends to present you gorgeous lot with some creative alternatives to the traditional wedding cake but also to show you the huge number of ‘buffet’ options at your fingertips. A candy bar stuffed full of jelly beans, gummy sweets and tangy treats is the perfect late night snack for hungry guests. Opening essentially what is a free tuck shop is also a splendid opportunity for you to share your favourite childhood sweet choices as well as entertaining your friends and family too. I have to confess though that the aspect that I really love about sweetie bars is not derived from their gastronomical delights but from the details and colours that they offer up as part of the overall wedding decor. 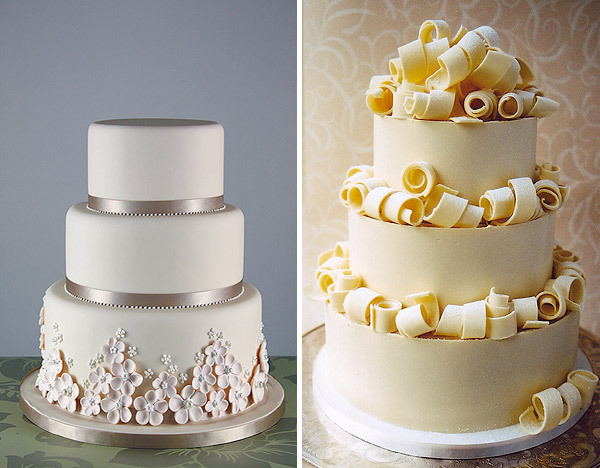 Top Row: Photography by Exhibit Emotions via Rock My Wedding.Second Row Left: Image via The Cake Blog. Second Row Right: Image via My Waiheke. Third Row Left: Image via The Handmade Home. Third Row Right: Image via Onto Baby. Fourth Row: Photography by Lisa Dawn Photography via Rock My Wedding. Fifth Row Left: Image via Martha Stewart Weddings. Fifth Row Right: Image via Kate Webber. Sixth Row Left: Image via Perfectly Imperfect. Sixth Row Right: Image via Style Me Pretty. Seventh Row: Image via Amy Nixon Events. A successful sweet bar is one that has variety – both in the type of sweets that it offers to guests and in the vessels that said candy is contained within. Tall apothecary jars look fantastic when contrasted with smaller vintage dishes and prevents the table from looking too flat. Opting for containers made from different materials and textures adds interest too. One other trick I use to help pull together a great table is by paying attention to the finishing touches. Designing ‘pic n’ mix’ bags with the wedding date inscribed on the front, adding miniature banners depicting confectionery names and adorning the table itself with bunting and glitter in the couple’s colour palette adds pizzazz and vibrant pops of colour to the overall decor. There’s a new cake in town and it’s called Pie. Like almost all of the most popular, modern, wedding trends, this craze has come from our cousins across the pond and demand for it is quickly growing. Pies are the ultimate in comfort food and represent a refreshing alternative to the traditional wedding cake, not to mention they’re much kinder on the pocket too. Don’t they just remind you of going to your nan’s house when you were a wee one. To this day, the smell of freshly baked apple pie instantly conjures up happy memories spent with my grandparents. Choosing a pie-based dessert provides you with oodles of variety. The list of fillings is seemingly endless – cherries, berries, apples, pumpkins and pecans are just some of the options available to you – which means that there should be something to please even the fussiest of eaters. Top Row: Image via Ritzy Bee. Second Row Left: Image via Style Me Pretty. Second Row Top Right: Image via Brides. Second Row Bottom Right: Image via Lemon Sprinkle. Third Row: Image via Green Wedding Shoes. Fourth Row Left: Image via Sarah Mckenzie Photo. Fourth Row Right: Image via Adventures Cooking. Fifth Row Left: Image via iloveswmag.com. Fifth Row Right: Image via Life Is A Party. Look for interesting cake stands to proudly display your pies on. Check out eBay, secondhand shops and even the unlikeliest of places…tin cans from the recycling box anyone? Try also to create depth within your pie table by using stands of different heights and/or styles. I’m currently smitten with images of open dressers stacked to the rafters with pie and other knick-knacks. They look so good, it almost seems a shame to eat the crusty treats. Don’t forget to label your pies either especially if any of your guests have food allergies. Flags, in the same style as the rest of the event stationery, popped into each pie is a cute way of getting the message across. Lastly I love the idea of involving your nearest and dearest in your big day by asking them to cook a pie for your dessert table. Why not hold a baking competition with the winning pie claiming the coveted title of the ‘Official Pudding of the Bride and Groom’ to be consumed every year on your anniversary. Not all buffet tables need to be food-based, in fact setting up an interactive drinks bar for your champagne reception can be the perfect tool for encouraging your guests to mingle. If your event is taking place outside then I’d suggest setting up your bar on something other than a standard table covered with a tablecloth. This is a fantastic opportunity to be creative and reflect the wider wedding theme in some smaller key elements of your decor. Perhaps you could spread some scaffolding planks across a couple of old barrels for a raw and rustic theme like the top image here or even have some pieces made for you which you can then use later in the home. I particularly like the exposed wood trays on stilts here which would be perfect for displaying potted plants in the garden once your big day is over. Top Row: Image via Indy Getting Hitched. Second Row Left: Image via Indulgy. Second Row Right: Photography by Ken Kienow Photography. Third Row: Image via The Loveliest Day. Fourth Row Left: Image via Katie Lamb Photography. Fourth Row Right: Photography by Rosie Parsons via Rock My Wedding. Fifth Row Left: Image via Audrey Magazine. Fifth Row Right: Image via Maddy Cakes Muse. Sixth Row: Photography by NavyBlur via Rock My Wedding. Lemonade stations are easily the most popular type of drink displays but expanding the theme to a tea pit-stop or a milk and cookies bar is just as effective. FYI – I am so having a milk and cookies zone at my wedding. Imagine the photos with all those milk moustaches. Your glasses needn’t conform to the norm either. Old jam jars accompanied by a jaunty straw and labelled with your guests’ names mean that drinking vessels won’t get mixed up as well as doubling up as a small memento of the day once it’s over. This part of the post is all about the weird and wonderful variations on the dessert table theme and boy have we got some things to show you. For those of you enticed by the dessert table concept but who want to do something a little bit different – this is for you. Think velvety madeleines, elaborate croquembouches, decadent s’mores, customised cookies, perfectly popped popcorn and melt-in-your-mouth macaroons. This is all about elevating the dessert table from a three-tiered cakey affair to an art form. Perhaps you’re having a rustic, outdoorsy do where a toasted s’more will go down a treat or maybe you and your beloved are movie buffs so setting up a popcorn bar is the only way to go. Whatever your interests or wedding themes are, there’s just so much you can play with so I encourage all of you to really embrace it. Remember it’s your day, your way. Top Row Left: Image via Christina Logan. Top Row Right: Image via Everything Fab. Second Row: Image via Amy Atlas. Third Row Left: Image via madsmininger. Third Row Right: Image via Design Sponge. Fourth Row: Image via Green Wedding Shoes. Fifth Row Left: Image via Kate Landers Events. Fifth Row Right: Image via Amini Concepts. Sixth Row: Image via Kara’s Party Ideas. My favourite dessert table ‘variation’ is the self-serve ice-cream parlour and I particularly love the vintage setup at the bottom of this board complete with all the necessary trimmings for the most amazing iced treat. 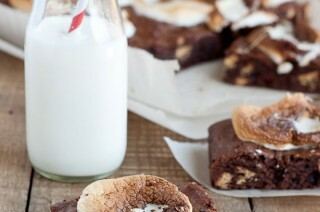 Opting for a slightly different dessert concept doesn’t have to cost the earth either. Toppings, cones and ice-cream can be purchased from your local supermarket and dishes and containers for the set-up can be found at Ikea for bargain prices. Remember that presentation is paramount to making this set-up, look and feel amazing – don’t put too much out at the same time otherwise it can appear sloppy. Equally make sure that someone is nominated to keep an eye on spills and to top things up if necessary. 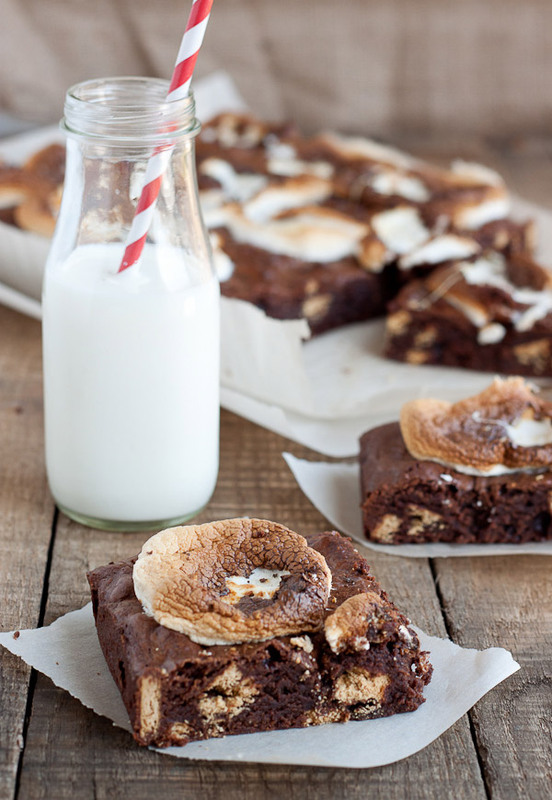 All that there remains for me to say is, sweet toothed connoisseurs – eat your heart out! Lots of it. Lots and lots of it! At RMW HQ we’ve noticed more and more brides are opting for an opulent dessert table instead of the wedding cake and the more conventional pudding. Frankly why wouldn’t you – you can have your cake (and then some more) and eat it. For me, dessert tables have two stages to them. Obviously there’s the actual sampling of the culinary delights but it is the visual impression of the delicious display that comes first. Long story short – if it looks good then you can guarantee it will be a success. 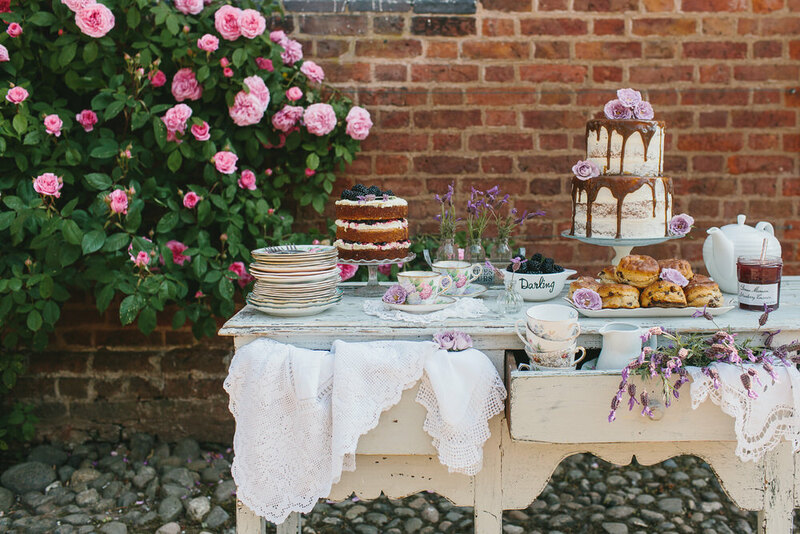 Opting for a cakey buffet is the perfect opportunity to continue your wedding theme. Try to bring together the design of your table, your florals and your wedding stationery to produce a single cohesive look that packs a punch. Lavishing attention on the backdrop of the table, the colour scheme and the dessert menus are all surefire ways of giving your table pizzazz. Top Row: Image via My Little Jedi. Second Row Left: Photography by Exhibit Emotions via Rock My Wedding. Second Row Right: Photography by Exhibit Emotions via Rock My Wedding. Third Row Left: Image via Pearl and Godiva. Third Row Top Right: Image via ruffled originally from Sweet and Saucy Supply. Third Row Bottom Right: Image via This Is Glamorous. Fourth Row: Image via Green Wedding Shoes. Fifth Row Left: Image via Hostess With The Mostest. Fifth Row Right: Image via Jenny Cookies. Sixth Row Left: Image via Ruffled. Sixth Row Right: Image via Style Me Pretty. And if you really want to flex your creative muscle then why not take your table to the next level. Upturn bowls and place cloches on top to give height to your displays. Collect antique dishes for a vintage feel, or encase your cupcakes in gold for a dose of luxe. If you’re confused about the number of portions a dessert table should provide for your guests then I’d follow this rule of thumb. If you’re choosing to skip cake and will just provide mini puddings instead, then I’d recommend approx 3 desserts per person. Something else to consider is the number of different types of treats that you’ll display on your table. Too many and you risk overwhelming your guests, too few and the aesthetic impact of the display will be limited. Aim for about 4-5 different choices for a happy medium. So is anyone else hungry now? All that talk about foodstuffs of the cakey variety has left me in need of a major sugar fix. I’m not fussy – right now I’ll eat just about anything…but I do like chocolate. So have you thought about incorporating a delicious dessert table into your big day? Perhaps the idea of organising one more thing is just too much to bear? We want to hear what you have to say guys and gals…. One of the best things about working in the wedding industry is that I get to indulge daily..hell even hourly.. in my passion for all things ‘details’. Usually I’m drawn to beautiful flower arrangements, adventurous stationery suites and exquisite table set-ups but a wedding I attended at the weekend got me thinking about one aspect that we don’t focus on all that regularly. You see folks, the bride and groom at aforementioned wedding had commissioned a wedding topper that made me squeal with delight. Quite possibly it was something to do with the two miniature cats that sat next to the figurines of the married couple but I loved the fact that they’d paid so much attention to this particular detail. 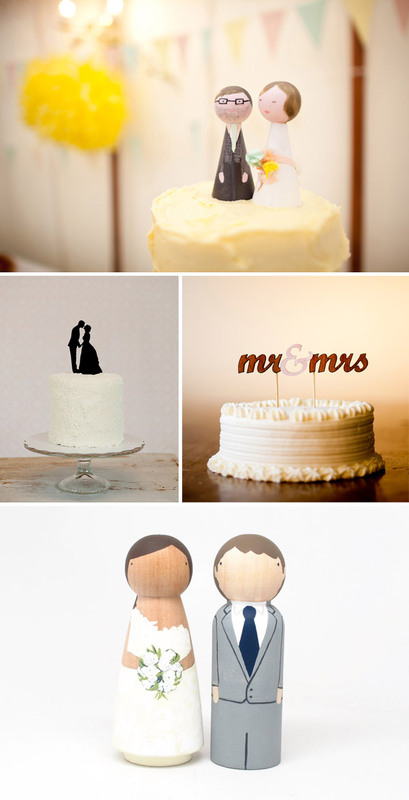 I love wedding cake toppers, I really do. They speak to the kitsch ‘Tina Sparkle’ part of my personality and it’s impossible to resist. So when I caught up with Charlotte during our marathon game of rounders on Sunday, I jigged on the spot and told her I simply had to write a piece on these beauties which is why, lovelies, you’re reading this now. So for how long has the humble wedding topper been making its appearance at the nations’ weddings? Allow me to take you on a 5 minute whirlwind tour of its history. Cake toppers really came into their own in the 1950’s in the good ol’ US of A. These were the golden years for these frivolous garnishes. If you get the chance to have a look then you can find some fantastically elaborate designs still out there today dating from this time. However it appears that they’ve actually been around since the 1890s (can you believe it?!) before becoming commercialised in the 1920s. One of the most heart-touching things I learnt about these ‘Mr and Mrs’ decorations was the tendency to dress the groom in military uniform during the Second World War. For many new brides, the cake topper was not so much a piece of decorative whimsy but a keepsake possessing a huge amount of sentimental value as they lost their partner on the battlefields. Something which I think is still pertinent today. Call me an old (hopeless) romantic but I have this foolish notion about being able to pass on my topper to my children and perhaps their children too. But I’m not alone, in fact there are an increasing number of brides who are using their parents’ and even their grandparents’ toppers to garnish their modern day wedding cakes. A wonderful way of ticking off the ‘something old’ as the saying goes. I’ve also noticed a renaissance of late in the use of silver bells and wreaths, doves and love birds to grace the top of sweet treats. I love this harking back to the traditions of earlier times and it feels particularly apt considering the vintage revival in other aspects of wedding decor and fashion. Doesn’t the romance of some of these toppers make you wish you’d been born in bygone eras? For all brides, but especially those with a smaller budget, cake toppers are an inexpensive way of adding personality to your big day. Purchasing shop bought confectionery and finishing it with a custom made flourish really makes it uniquely yours and it doesn’t have to break the bank either. The good news is that there’s just so much choice available to you folks. I spent the best part of the day on etsy looking for some snazzy duos and ended with a huge shopping list. If you want it, they can probably make it. 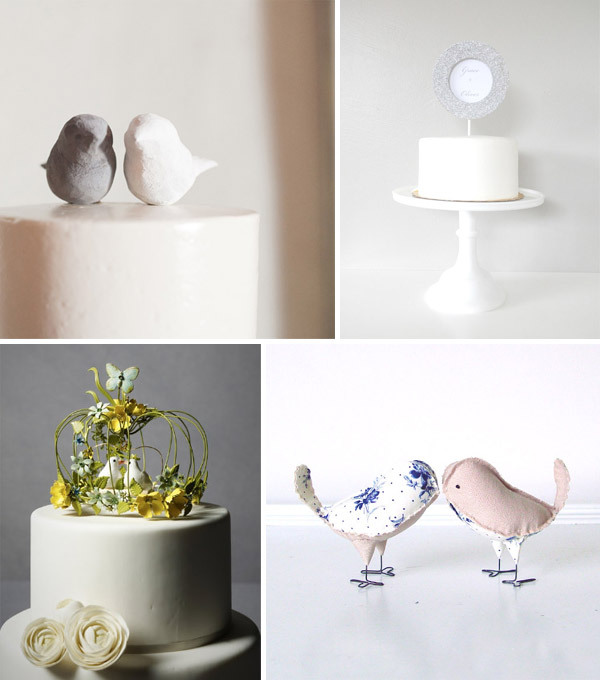 If you’re not enchanted by the bells and the birds but you want your cake to have a vintage feel why not consider using a family heirloom or a piece of jewellery that is particularly important to you on your top tier. This is a wonderful way of bringing loved and lost ones into your day. Traditional figurines have oodles of character and on the right cake they can pack a punch. 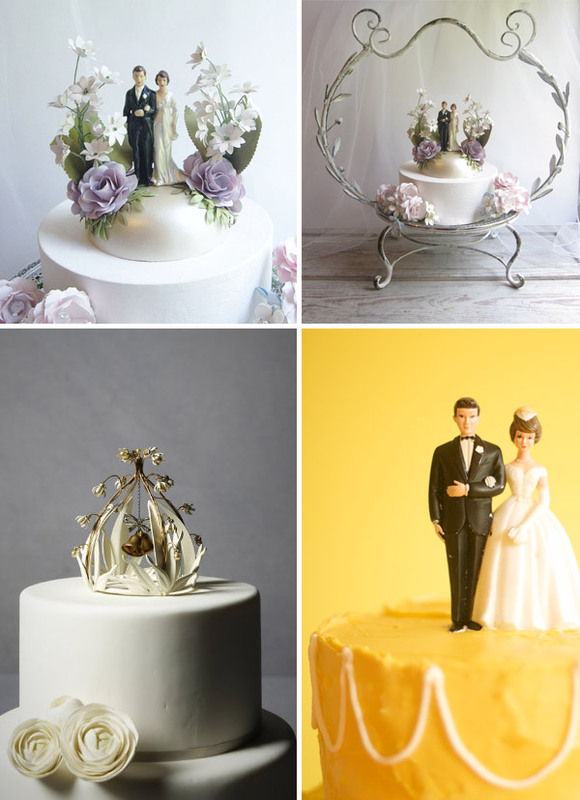 Don’t be afraid to mix and match different cake toppers to make your perfect pair if the one you’ve found isn’t right. You have to kiss a lot of erm..frogs.. to find your perfect topper. Top Left: Topper via BHLDN. 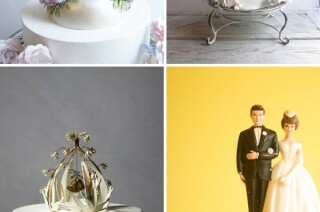 Top Right & Middle Left: Wedding Collectibles via Etsy. Middle Right: Sweet & Saucy Shop. Bottom Left: The Cake Girls. Bottom Right: Cake Pins via BHLDN. I’ve always particularly loved the idea of flowers perching atop of a beautiful wedding cake, whether they be sugar blooms or freshly grown beauties. Plenty of brides use this opportunity to match their bridal bouquet to their cake ensuring that their theme continues through all elements of the wedding. Miniature bunting is a brilliant way to inject a bit of light-hearted fun into your day and it can also be used to reflect the decor of a village fete wedding theme. 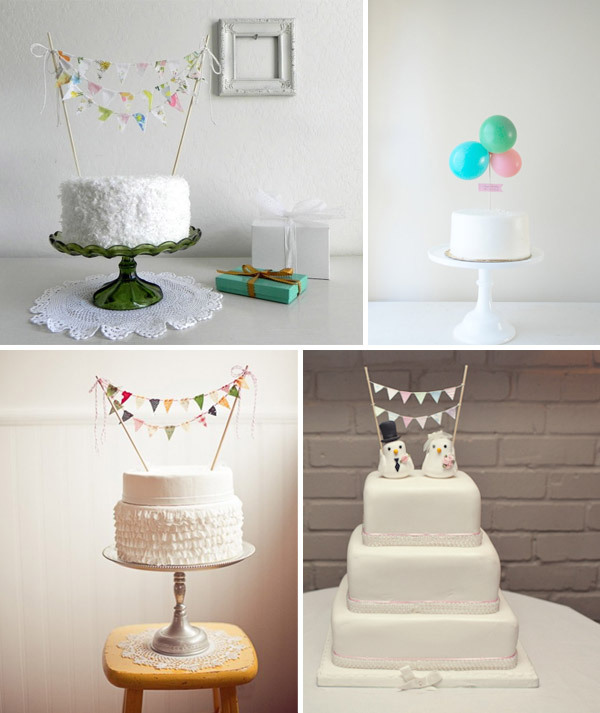 And check out those miniature balloons – who doesn’t want teeny tiny balloons on their cake, seriously people! Monograms and silhouettes can no longer be accused of being ‘fuddy-duddy’. There are plenty of suppliers who can supply acrylic or wooden toppers that spell whatever you want in your favourite font or even customise silhouettes of you and your beau. Perhaps you could even be a little bit…ahem…naughty here. Equally, if you’re not a vintage-loving bride then there’s something for you too. The minimalist figurines below are made from wood and can be painted so that they resemble you and your other half. How sweet are they?! Did anyone else have skipping ropes with the painted people handles when they were a child – do these toppers remind you of them or is it just me? So what do you think? Do you even like the idea of this extra flourish on your cake or have cake toppers gone past their sell by date? Are they twee and old-fashioned or cute and irresistible? Have any of you splurged on a pièce de résistance? The boy and I still haven’t quite decided yet if we’re going to have one on our cake. I want one, he doesn’t. Perhaps you can persuade him. Are you looking for a super fancy cake? Well then look no further… Introducing, Robineau Patisserie. Jane and Frédéric are the award winning team behind Robineau Patisserie. They create amazing bespoke wedding cakes and wedding favours, as well as hand made chocolates and daily patisserie. Their work has featured in OK! magazine and other national press, and they were commissioned as cake designers for the popular ITV show “Ladette to Lady”. Robineau have created wedding cakes for clients such as Duncan Bannatyne from the BBC TV show Dragon’s Den and Tom Aikens, Michelin starred chef, amongst others. 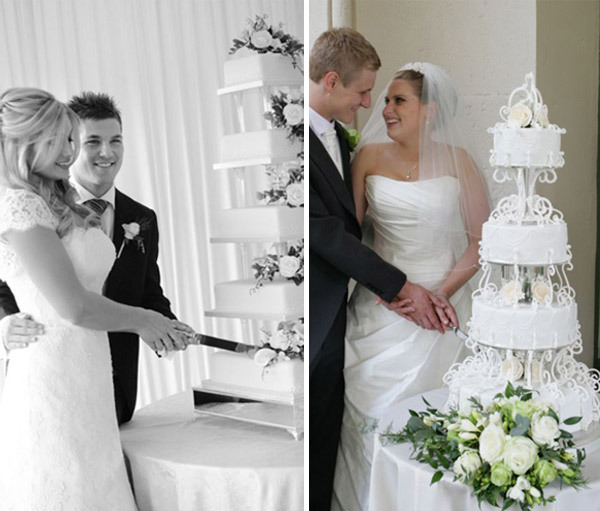 The Robineau Wedding Cake collection features twenty two beautiful handmade designs to choose from. Prices for the Iced wedding cakes and Chocolate wedding cakes can be found on the website. The Robineau Bespoke Service is exclusive and personal, blending individual dreams with unrivalled craftsmanship. For more information on the bespoke service, please contact Jane directly through the website. This is a Sponsored Post, however all sponsors and sponsored posts are hand selected to remain in keeping with the Rock My Wedding ethos.